It’s crazy to me how within the span of days we can go from needing the air conditioning on at night to being tempted to turn the heat on in New York. I didn’t actually turn the heat on because I like to play this game with myself to see how long I can hold out every year and the first week in October would just be like giving up in the first quarter of the game. Some would call this stubborn, I prefer to think of it as incredibly persistent and committed. While I’m not necessarily looking forward to the inevitable leaf falling (omg, we have SO many in our yard it’s like an around the clock chore for a month to clean them up) and the barren, colorless world we’ll then live in for the next 5 months or so, these colder temps do make me happy for one thing; comfort foods. Cozy fall days where I can throw on a comfy sweatshirt, simmer something delicious on the stove for a few hours and curl up with a bowl of it in front of the tv later on. 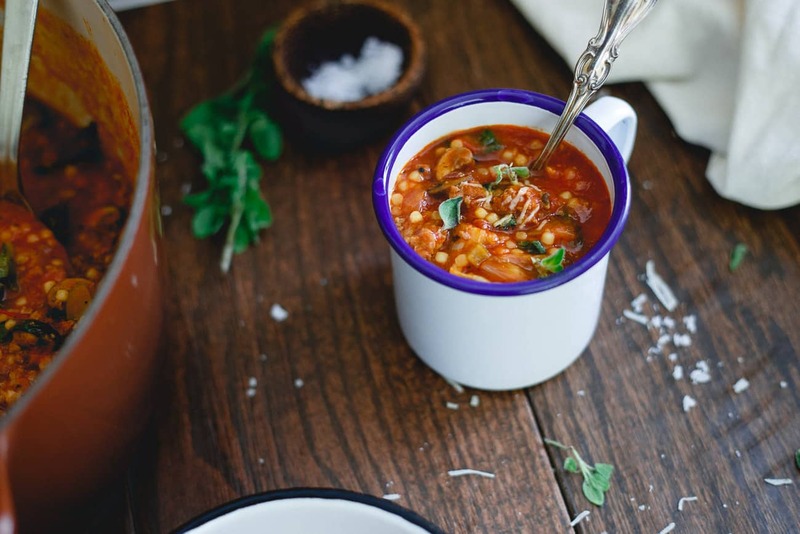 This Italian tomato pasta soup is just that. A few weeks ago, I had the pleasure of visiting the Tuttorosso headquarters in Indiana. 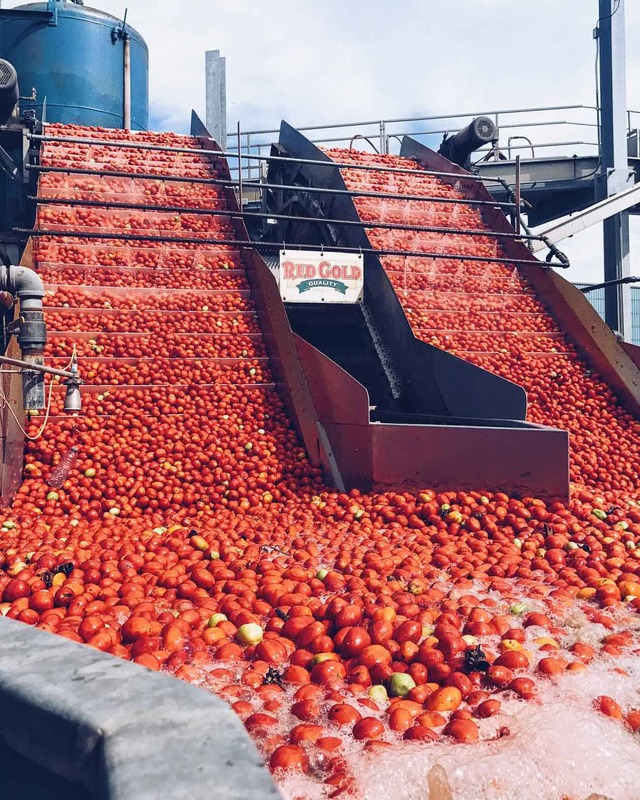 We visited Triple S Farm that grows tomatoes for Tuttorosso and got to meet the family that runs it, toured the plant and saw the entire process the tomatoes go through from coming in on the truck to being sealed in cans (in just about 1 hour! ), had a wonderfully inspiring photography session with Amanda of Heartbeet Kitchen and ate dinner at a local creamery with an amazing farm to table spread. One of the most memorable events though was the “cutting” we did while at the Tuttorosso office. 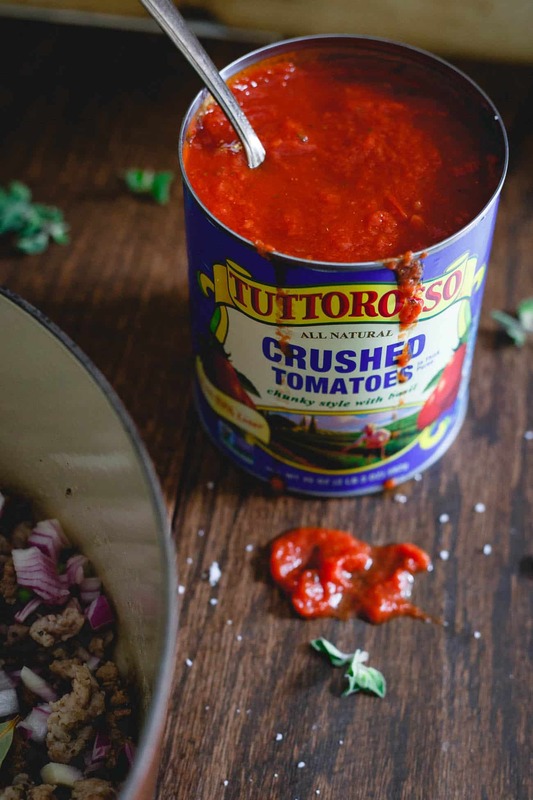 Tuttorosso, a family owned company, prides itself on the quality of their tomatoes (they’re the best selling Italian inspired canned tomato brand in the U.S.) and how they actually look and taste like ripe whole tomatoes coming out of the can. We opened at least 7 competitor brands and not only saw the difference in appearance but tasted it too. 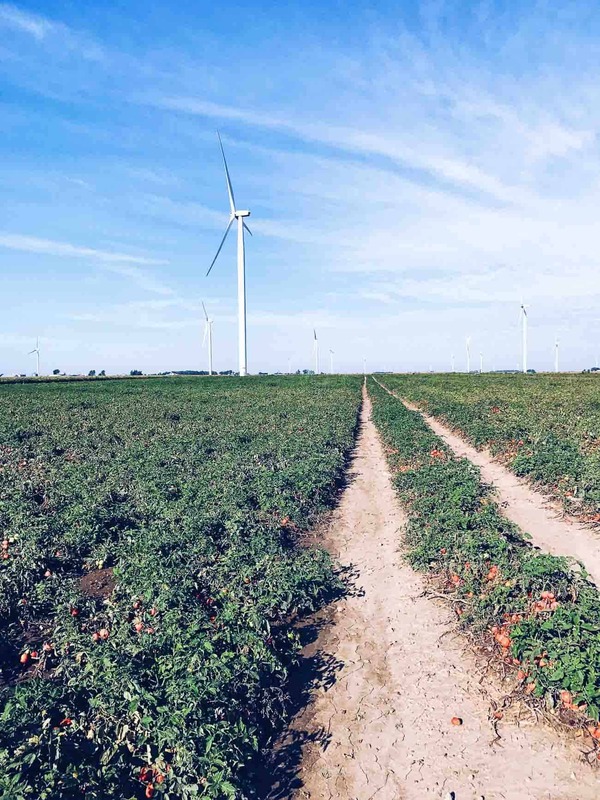 While some other brands taste like that metallic-tin flavor you sometimes associate with canned tomatoes, Tuttorosso (which are all non BPA lined) tasted like a tomato I’d eat straight from the garden – and looked like it too, just peeled! Of course, using Tuttorosso at home almost exclusively, I already knew this but the side by side comparison was jarring and definitely reaffirming as to why quality ingredients are so important in the final outcome of a recipe. I used to use the term “garbage in, garbage out” all the time in my previous job while giving presentations about the work order systems in colleges and universities and it came to mind during this comparison and taste test. Your Sunday sauce will only taste as good as the tomatoes you start with so don’t you want to start with the best tasting ones you can? I boarded the plane home from Indiana in 80+ degree temperatures thinking it’d be some time still until I needed to break out the canned tomatoes seeing as fresh ones were still a dime a dozen, but within a week, it was crisp and fall-like at home and visions of this comforting Italian tomato pasta soup were swirling about in my head. During the product tasting, I fell in love with the Tuttorosso 35-ounce crushed tomatoes – chunky style with basil. I was literally eating it out of the little plastic cup and I swear it could’ve passed for my grandmother’s sauce straight out of the can. 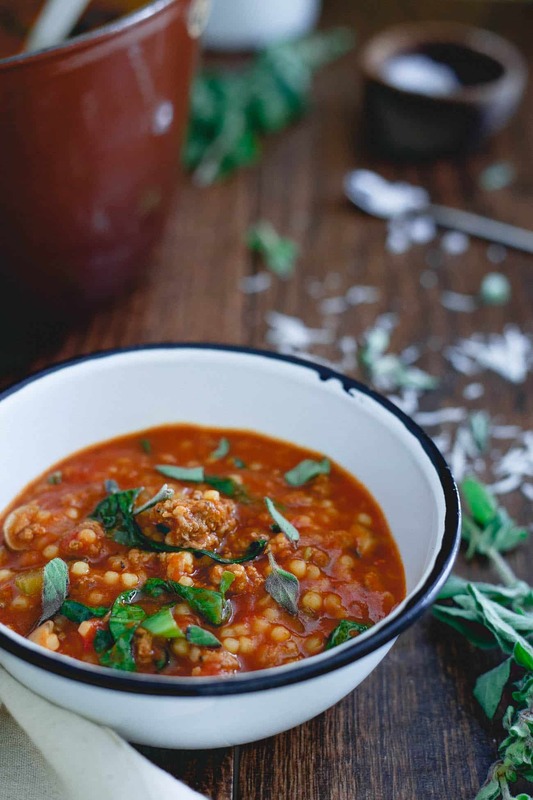 Using it as the base for this hearty tomato soup loaded with both ground beef and sausage, it’s as if my family’s Sunday macaroni and meatball/bracciole/sausage tradition of the past was reinvented in my own way. 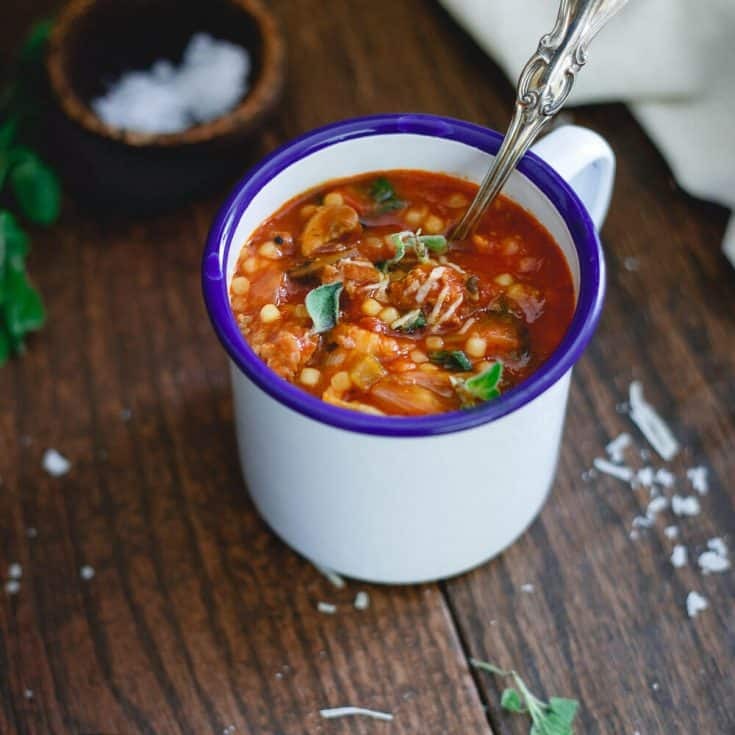 The taste of quality tomatoes simmering all day on the stove with the comfort of a pasta dish combine in this Italian tomato pasta soup. Chunks of mushrooms and some escarole round out the flavors and I can guarantee you it’s quite honestly the most cozy thing you’ll eat all season. Of course, this slow cooker short rib ragu and these chocolate red wine beef stuffed potatoes are close runners up! Italian tomato pasta soup is filled with hearty ground beef, sausage, mushrooms and escarole. 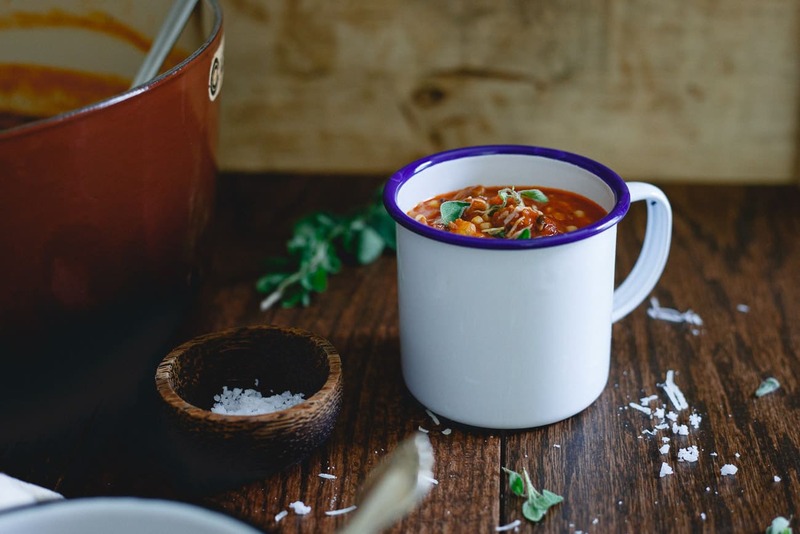 It's the perfect bowl of comfort for the colder months ahead. Heat the olive oil in a large Dutch oven over medium heat. Once hot, add the beef and sausage breaking up into small pieces with a spatula. Cook until browned. Add the celery, onion, mushrooms, bay leaves, garlic, oregano, salt and pepper. Stir to combine and cook another 4-5 minutes until softened. Add the tomatoes and beef stock. Stir well, cover, reduce heat to low simmer and cook for about 1.5 hours until slightly reduced. 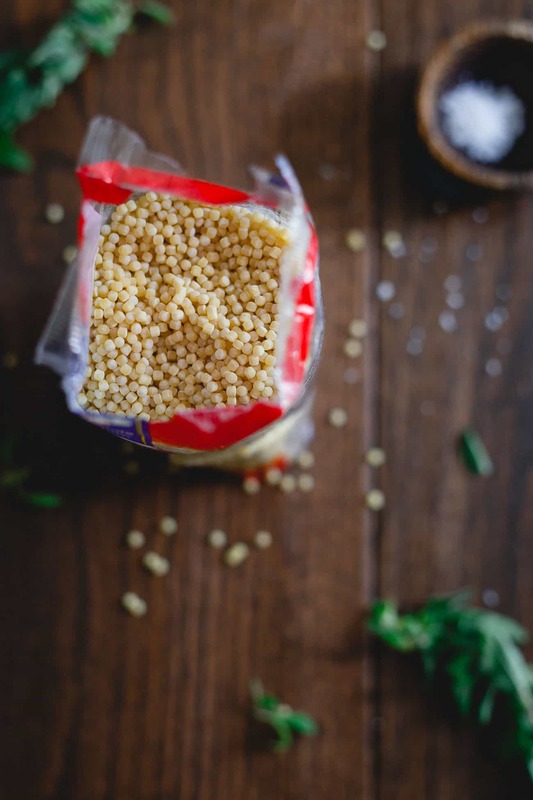 Remove the cover, add the pasta to the pot, stir and cook according to package directions. Add the escarole during the last minute of cooking. Stir into the soup until wilted. Season to taste with more salt or pepper as necessary before serving. The pasta absorbs a lot of the liquid while cooking. If you want more broth in the soup, use more beef stock. Anywhere from 32-48 ounces will work. I need a big bowl of this soup stat! Gorgeous!! 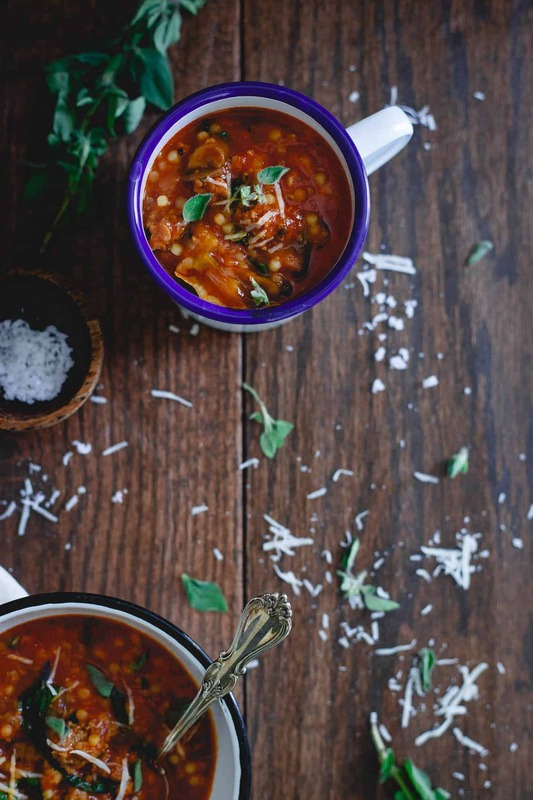 This is so hearty, exactly how Fall soup should be. Love it! Sounds like you had a fun trip Gina! I always use Tuttorosso tomato puree with basil when I make my homemade sauce. It’s the best! This soup sounds so delicious. Perfect to warm us up with the cold weather that will be headed our way soon! Enjoy your week! Soup season is my jam! This looks amazing! That first shot of the soup is gorgeous!!!! Your trip sounds amazing and I will look for Tuttorosso or Red Gold tomatoes at the store! Thanks for this post! Sounds like a great trip. How fun to watch the magic happen. This soup looks like pure comfort food. Oh it’s currently 55 degrees inside my house. But I’m stubborn AF and won’t turn the heat on just yet! Lol! This soups looks fantastic and love that photo of all the tomatoes on the conveyor belt going for a bath! That mug of soup looks so wonderful to me right now! Looks like you had a great visit with the tomato harvest, too! Oh boy! Top of the Pops ! Great photos, too ! Love the color. It looks so tasty and healthy as well. This recipe is very easy to made but valuable and very good for our health. My friend already proposal for made it tomorrow in my kitchen room. Thanks a lot. I’m so happy i stumbled upon this. I actually had left overs I wanted to use and i was able to throw it all in. I had sauteed mushrooms, swish chard with beans and sauteed zucchini. I did not have a can of Crushed tomatoe so i substituted with one 14 Oz. can of diced tomatoes and one can of diced tomatoes with green onion and celery. I still added fresh onion and celery into the meat. I also had homemade marinara to make up the rest of what i needed from not having the crushed tomato. Wow, this was fantastic! I can’t wait to eat this again. Thank you!! Glad you made it work with what you had on hand!